Cause Related Marketing's time has come. Consumers are demanding greater accountability and responsibility from corporations. In an environment where price and quality are increasingly equal; where reputation and standing for something beyond the functional benefits of a product or service is all, brands are constantly competing for customer loyalty and consumer attention. 'Cause Related Marketing' is one of the most exciting areas in marketing today which benefits both business and society. * positions Cause Related Marketing in the context of marketing, corporate social responsibility and corporate community investment. * explores who cares and why, providing research analysis into corporate and consumer attitudes both in the UK and internationally. * uses The Business in the Community Cause Related Marketing Guidelines, written by Sue Adkins and introduced by HRH The Prince of Wales, providing an in depth exploration of the key principles and processes that go towards creating excellence in Cause Related Marketing. * includes vignettes and in depth case studies to provide illustrations of Cause Related Marketing through a spectrum of examples both national and international. Sue Adkins, Director of the Business in the Community's Cause Related Marketing Campaign is acknowledged as an international expert. She is recognised as having put Cause Related Marketing on the map in the UK and leading the drive to establish Cause Related Marketing as an increasingly legitimate part of the marketing mix in the UK. 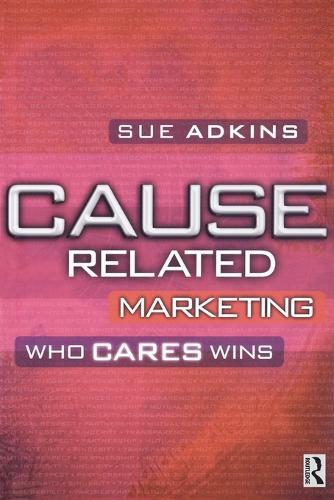 "Sue Adkins... has defined Cause Related Marketing in the UK. She has built the business case for Cause Related Marketing for the benefit of both business and the wider community and has in fact been the leading campaigner in establishing Cause Related Marketing as a legitimate part of the marketing mix. I recommend this book to you and urge you to consider how the potential of Cause Related Marketing can be released for the benefit of your organization and the wider community"
Sir Dominic Cadbury, Chairman Cadbury Schweppes. "Sue Adkins is a great expert in Cause Related Marketing and I commend her book to you....She has done more to define, identify, campaign and expose the business benefits of Cause Related Marketing for businesses and causes in the UK, than anyone else."